In order to learn more about the Alice experiment, we decided to talk with one of the first people trying the interface—Lærke. 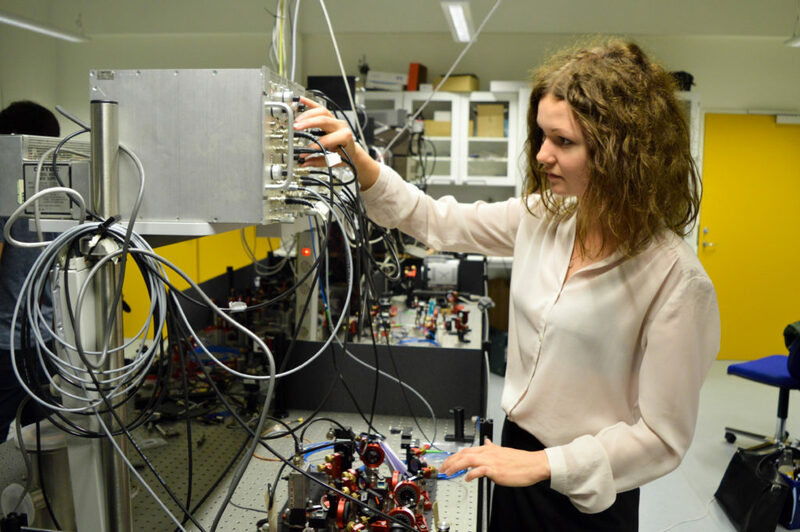 Lærke is just about to start her 3rd year as a student of physics at Aarhus University. Quantum mechanics is one of her favorite subjects, so when she heard one of Jacob’s talk about ScienceAtHome research, she immediately asked if she could contribute in any way. Indeed, Lærke helped us to observe how people without extensive physics training can perform experiments using Alice. But first things first. What is the Alice experiment? L: In order to perform these experiments, involving moving atoms with a laser beam, we need to make Bose-Einstein Condensates (BEC). In order to make those, atoms have to be cooled down to extreme temperatures and confined in a small space. For the experiment to be successful these condensates have to be as big as possible, thus we need to cool down as many atoms as possible. That’s where Alice comes in. BECs are achieved by using magnetic fields and laser beams. On the Alice interface, a user can adjust the power of two laser beams and the intensity of the magnetic field in the lab. I think about it as creating a small well of energy. If atoms have more energy than the well, they will escape. If the energy of the atom is lower, it will stay within that well. Once you have set those three variables to your desired position, you send the data to the lab and the experiment is performed. After that, based on the feedback from the lab, you can adjust the settings once more and repeat the experiment. L: I came with very low expectations. At first, I was very nervous that I will not be able to cool down the atoms efficiently, so they can form a BEC state. Secretly, I thought to myself that if I can achieve a score that they usually produce in the lab (around 2mln atoms in BEC state), I will be more than happy. But in fact, I did better than that: in 6 hours or 54 scans, I achieved a score of 2,4. And I had a lot of fun while doing it! What helped you to perform well during Alice experiment? Was it difficult? L: The programme itself is very intuitive and easy to use. ScienceAtHome team was very helpful by directing me to a lot of interesting articles and answered all my questions before starting the experiment. I tried to apply my newly gained knowledge during the experiment as much as possible. Then, it was all about incorporating the feedback from the lab and trying again. It was really fun! A lot of learning and practical application. Do you think anybody could use Alice? L: Yes, I think so. I am very excited to see people using it and building new solutions because anybody can use a programme like that. What is interesting about it, is that it is indeed real atoms in the lab, which are really unstable and fragile. It’s hard to just guess the right formula. However, even if you don’t have a prior theoretical knowledge of what a magnetic field does to the BEC, you can still learn very quickly from the feedback you get from the lab. In my point of view, the whole Alice experiment contains two very important implications. Firstly, the whole idea that you can be somewhere else and get to use the lab, which subsequently makes science more accessible to everyone. Secondly, the idea of what happens when a lot of people are working in the group—the power of group contribution.